I still can’t believe how much stuffed mushrooms make me happy. Well, mushrooms in general, to be honest! And I love how these are so zesty with the lemon and pack a proper flavour punch to stand up to the mushroomy flavour of the mushroom. Damn do I love lemons. And mushrooms. And feta, oh my! 1. Mix feta, lemon juice and rind, capsicum and chili in a bowl. 2. 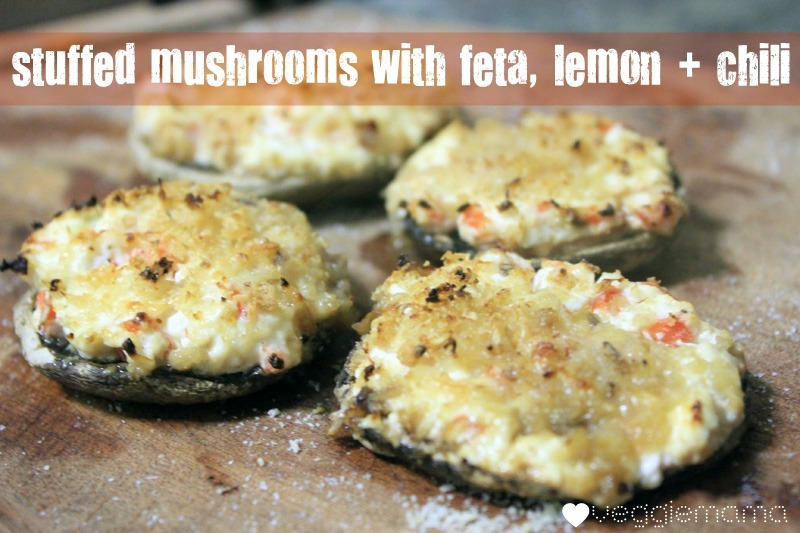 Spread into upturned mushroom caps, and top with breadcrumbs and parmesan. 3. Bake in a hot (200C) oven 10-15 minutes until heated through and golden on top. I cannot wait until we move and have an oven so I can try this! Drool! This looks good! I've not stuffed any mushrooms for a while! Wait til you try them! Sometimes I love them with just garlic butter… but sometimes they need more fun! I made this for lunch today and it was super yummy – one more large mushroom left so I can make it another day as well! Thanks! Send some to me next time! they're my favourite. Just made this for dinner! OMG soooooo good! More then divine! My husband absolutely loved it, and he is not usually a fan of mushrooms! Can’t wait to have people over, such an easy dinner that can be prepared in advance!